David Pipe - One of the UK's most successful racehorse trainers was struggling to run his business in rural Devon. "We are racehorse training business based on a farm in Nicholashayne, Devon. Postcode below. Connecting Devon and Somerset have now enabled all our surrounding cabinets with FTTC – but we are too far from any of them to benefit. Our broadband thus remains at 0.5-1MB – with no realistic chance on improvement in the foreseeable future." We picked up signal on the roof of David's helicopter hangar, the tallest building in the yard. This brought speeds of as much as 80MB/s to the centre of operations and then beamed on the 400 yards to David's house so that his wife and family could enjoy fast broadband too. David and Delyth Pye decided to create a dream home on Delyth's parents' hill farm in Wales. Idyllic indeed but no broadband. 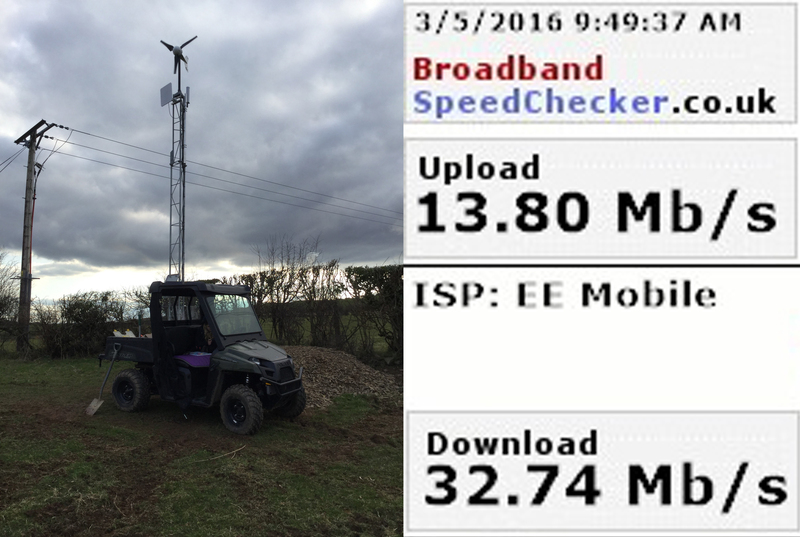 We visited the site, drove round the entire farm and then on one edge of the hill farm located some precious 3G signal. 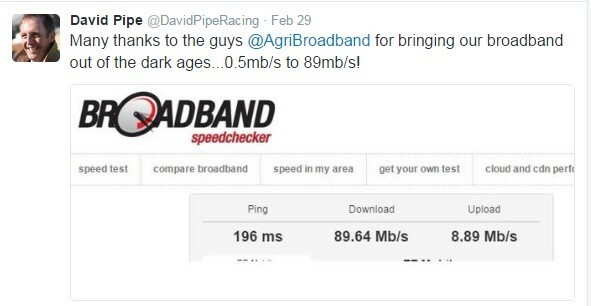 "I am sending you the first email over our newly installed Agri-Broadband solution Getting 30 megabytes down load speed, if you remember we only got 3G when you tested, but with the extra height of the mast we are getting 4g." Sue L - 78 year old farmer. Lives with husband in a remote farmhouse west of Salisbury. Sue had a fairly straightforward installation and now has speeds in excess of 60MB/s. Mary L- Bank Director with husband and three teenage daughters. Tonbridge Wells. “Current providers BT x 2 lines, speed on a good day 2Mbps each, but very variable.I spend my life on the phone to BT because it has dropped away again.Also TalkTalk x 1 line, speed around 2.3 Mbps.I then bond the three lines together, which works but is very expensive and reliant on getting something out of the BT lines. Chris C. Farmer, east of Winchester. David and Delyth's farm in Wales.